LUAS DRIVERS COULD launch industrial action over an ongoing dispute about their lunch arrangements – and the adequacy of employer-supplied cooler bags. At a recent Labour Court hearing, trade union Siptu, which represented the employees, said drivers are now obliged to take breaks in a different depot to the one where they signed on for duty following the opening of the new cross-city service last year. The union raised concerns about drivers’ capacity to carry food safely from their originating depots to the depots where they were scheduled to take their breaks. It said that this has resulted in an increased cost to drivers as they no longer have the option of bringing their lunches to work. The union added that if a driver goes to work by car, the vehicles would be left at their home depot – meaning they were “restricted in their capacity to travel to a shop or other food outlet at the other depot while on a 30-minute break”. 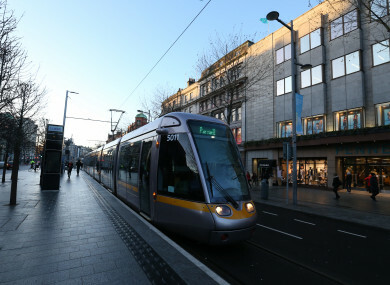 At the hearing, Luas operator Trandsdev said drivers had committed to “provide full cooperation with the extension of the Luas service” after a separate Labour Court hearing in 2016. The hearing came as a series of strikes among Luas drivers over pay and conditions threw the transport network into chaos over several days. The dispute was eventually resolved after drivers accepted a Labour Court-recommended pay rise. To help with new break arrangements agreed as part of the deal, drivers were supplied with a cooler bag to help transport food with them during the working day. However, the trade union expressed concern about the efficacy of these cooler bags. Transdev said cost of conceding to Siptu’s claim, which would involve hiring more drivers so that each staff member could eat lunch at the depot where they started work, would be €250,000 per year. At the hearing, the Labour Court said that the matter only appears to affect drivers on the Green Line Luas service. The opening of the Luas Cross City meant that in addition to the original depot in Sandyford, a new depot was established in Broombridge. The court said that it is reasonable for a driver to be required to take breaks at a different depot and the arrangement only affects a small percentage of drivers on certain days. On the topic of transporting lunches, the court added that it “would not normally concern itself with the functioning of cooler bags” and said that these issues should be easily addressed by the parties themselves. However, as the dispute has continued without resolution, it recommended that a risk assessment of the bag should be completed and Transdev should ensure that any cooler bag supplied to drivers is capable of transporting food safely from one depot to another. The court also recommended that the two parties should continue to work together to make sure drivers have access to similar facilities in all depots. The dispute was referred to the Labour Court after an earlier Workplace Relations Commission hearing failed to resolve the matter. Siptu organiser John Murphy told Fora that Luas drivers will now hold a ballot based on the recommendations from the Labour Court – and they may consider industrial action if the issue is not resolved. He said that ideally, drivers would like to have their break in the depot where they start their shift as it “isn’t practical to carry lunch all day”. If this can’t be achieved, he said that drivers should have access to “proper facilities and a decent level of food” in all depots. Transdev did not respond to a request for comment by the time of publication. Email “Luas drivers could take industrial action because new routes are messing with their lunch”. Feedback on “Luas drivers could take industrial action because new routes are messing with their lunch”.